Home /Why Has the Share of US Prime-Age Women in the Labor Force Fallen Behind Other Economies? In 1990, nearly three-quarters (74.0 percent) of prime-age women, ages 25 to 54, in the US participated in the labor force. Only the Nordic countries — Sweden, Norway, Denmark, and Finland — had substantially higher shares of women in the labor force, while women’s labor force participation in Canada was modestly higher at 75.5 percent. The US ranked sixth out of 22 Organisation for Economic Co-operation and Development (OECD) countries. Many countries that lagged the US at that time have now caught up and surpassed the US in women’s participation in paid employment. Figure 1 examines developments in women’s labor force participation in the US and selected other OECD economies over the last 17 years. Figure 1 shows that, since the start of the twenty-first century, the labor force participation rate of prime-age women in the US has fallen from 76.7 in 2000 to 75.0 in 2017. In contrast, it has risen in Australia, Canada, New Zealand, and the United Kingdom, as well as in France, Germany, and even in Japan. 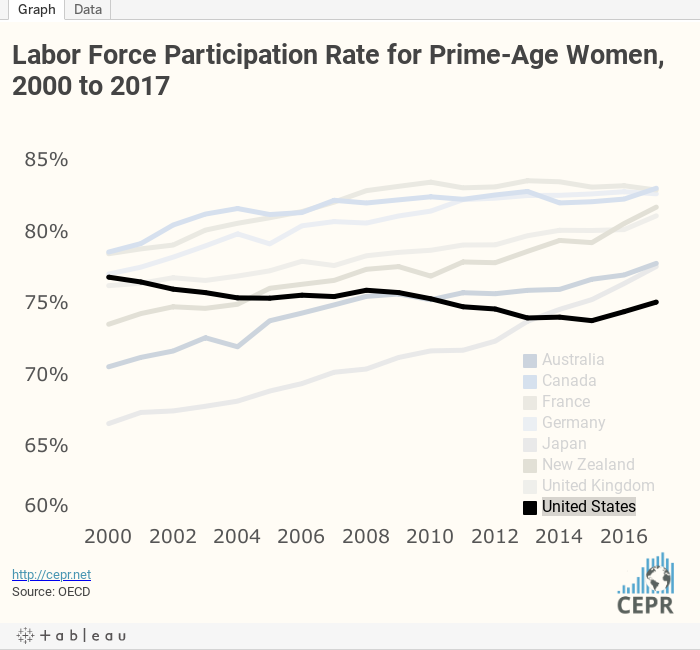 What explains the decline in women’s labor force participation rate in the US, both in absolute terms and, even more dramatically, in comparison with women in other advanced economies? The answer is that work-family policy has largely stalled in the US, which has no federal laws guaranteeing workers a few paid sick days or paid family and medical leave for a worker’s own or family members’ serious illness or to welcome and bond with a new child. Workers in the US do not have the right to reduce their hours of work and go to a part-time schedule at the same hourly pay rate. And, many lack access to affordable, quality child care. Other countries, meanwhile, have facilitated women’s employment by making it easier for women who want to work to combine holding a job with having a family. A 2013 paper by economists Francine Blau and Lawrence Kahn found that more weeks of paid leave and a higher wage replacement rate for wages lost while on family or medical leave led to higher participation rates in the labor force for women. The right to work part-time and equal treatment of part-time workers by employers similarly raised participation rates of prime-age women. Public spending on child care as a percent of GDP was four times higher on average in other industrialized countries than in the US, but the authors found no significant effect of this spending on women’s participation in the labor force. Other studies have found that the effects of subsidized child care or increased availability of affordable child care places depend on the national context. In some countries, such policies greatly increase the labor force participation of mothers. In others, they lead working mothers to substitute higher quality formal child care for lower quality informal arrangements, with little effect on overall participation rates of women. A national paid family and medical leave program that offers workers 12 weeks of paid leave, provides a reasonable replacement for lost wages, and guarantees workers a job when they return, could go a long way toward facilitating an increase in participation of women in the labor force in the United States.